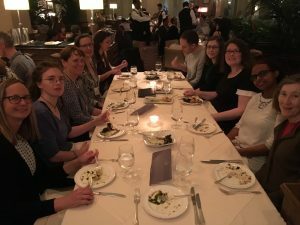 The Chapter hosted a successful dinner at the Medical Writing & Communication Conference in Washington DC. 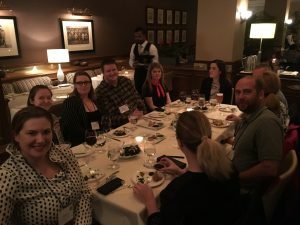 Twenty two chapter members and guests enjoyed dinner, networking and great conversations. See you in San Diego! An educational seminar was given Tuesday, April 3 at Richland Library in Nashville, TN. Following the presentation and Q&A session, food was provided and the attendees continued networking. A total of 8 members and 1 non-member attended the seminar. The discussion was lively, and members discussed future events and presentation topics of interest. 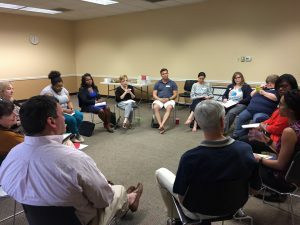 Bring networking events to your local area! Weekdays after work usually allow for more members to attend and make it easier to find a location that is conducive to conversation. Many restaurants with private dining areas will charge a deposit to use the room, but will subtract bar purchases from the deposits. Provide sign-in sheet (available from chapter secretary) to collect names and membership status of attendees. Purchase appetizers (and non-alcoholic beverages, at your discretion) for attendees. Attendees must purchase their own alcoholic beverage. Save your receipt for reimbursement! Provide a copy of the refreshment receipt to the treasurer. Please also provide an address for mailing your reimbursement check. Emily J. Woodward, PhD Clinical Development Scientist and Regulatory Writer at Synchrogenix, presented about the fundamentals of statistics for medical writers. Email invitations were sent to all members with information on how to attend in person or online. The presentation was live-streamed on Periscope and archived for later viewing by members unavailable to attend the in-person presentation. A replay of this event is available on Periscope. 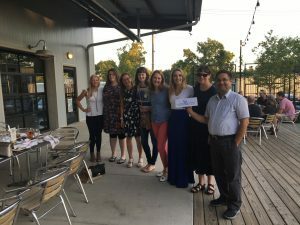 AMWA member Erin Thacker organized a networking event for Birmingham area medical communicators on Monday April 24, 2017 at Cahaba Brewing Company. Four AMWA members attended this meeting.